Mueller says VW Group will review its 300-model lineup. 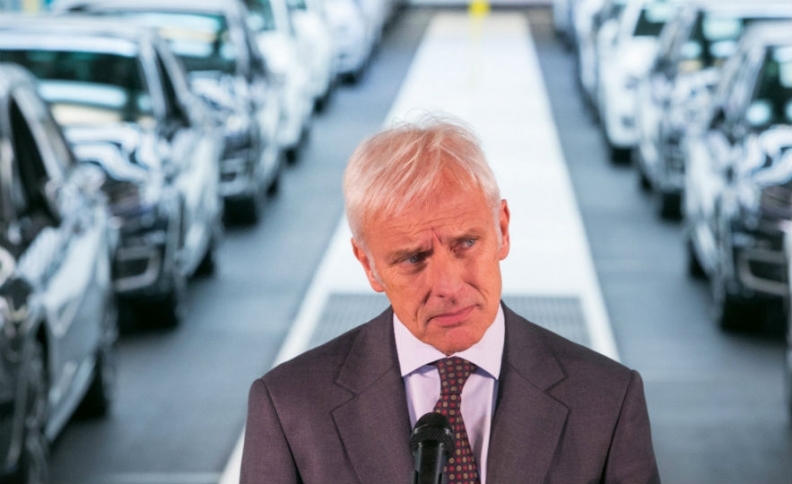 MUNICH -- Volkswagen Group is working on a new business plan - dubbed Strategy 2025 - that will focus on improving the automaker's profitably rather than on volume growth, said CEO Matthias Mueller. Strategy 2025 will be developed over the coming months and will be unveiled mid-way through next year, Mueller said in a statement on Wednesday. Mueller outlined key steps that will help the automaker restructure amid its diesel emissions cheating scandal. His priorities include reducing the number of models built by VW Group, whose portfolio includes luxury brands Bentley, Porsche and Audi, along with sports car maker Lamborghini and mass-market marques VW, Skoda and Seat. Analysts have long criticized the automaker for developing costly halo projects such as the Bugatti Veyron supercar. "We will review in detail our current portfolio of more than 300 models and examine the contribution that each one makes to our earnings," Mueller told analysts on a conference call Wednesday. Management will focus on addressing cross-brand strategies, leveraging synergies and ensuring that group resources are used effectively, he said. Another priority will be to decentralize group management with more independence for the brands and regions. VW Group considered lumping together the VW, Seat and Skoda brands but the board ultimately decided to keep them separate, Mueller said. Separately, Volkswagen reaffirmed plans Thursday to invest $900 million to produce a new midsize crossover starting in late 2016, $600 million of which would be invested in Tennessee, where VW operates its only U.S. assembly plant. The company issued a statement ahead of a hearing today by a Tennessee Senate subcommittee into the emissions violations to examine the scandal’s potential impact on the plant and whether VW’s job creation promises might be jeopardized. Tennessee state, county and local governments have provided hundreds of millions of dollars in cash and tax incentives to lure VW to the state, and lawmakers sought reassurances that the company would meet job creation benchmarks included in the agreement. One aim of decentralization will be to restructure the group to create a "culture of openness and cooperation," Mueller said. In a thinly veiled swipe at his detail-obsessed predecessor, Martin Winterkorn, Mueller said he will not get involved in the minutiae of product design, a task he said should fall to the divisions as part of the planned new culture of empowerment and decentralization. Mueller said VW is not abandoning its Strategy 2018, which included the target of selling 10 million vehicles globally by 2018, a goal that likely would have made the company the world's biggest automaker by sales volume ahead of Toyota. Critics have said this focus of boosting volume may have inadvertently led to the use of software that allowed VW to disguise the level of real toxic emissions in its diesel engines. Mueller said people outside and inside the automaker had misunderstood Strategy 2018 to be all about boosting unit sales, which meant that "a lot of things were subordinated to the desire to be 'faster, higher, larger,' especially return on sales." "The point is not to sell 100,000 more or fewer vehicles than a major competitor. Instead, the real issue is qualitative growth," he said. VW has said 11 million diesel cars sold worldwide by its VW, Audi, Skoda, Seat and VW light commercial vehicle brands had software installed that could cheat emissions tests. The company plans to launch the biggest recall to date, including 8.5 million cars in Europe, starting January. VW Group posted a 3.48 billion euro ($3.84 billion) third-quarter operating loss on Wednesday, compared with a 3.23 billion euro profit a year ago after the cheating scandal accounted 6.7 billion euros in special costs in the quarter. VW has suspended at least six managers have been suspended so far in connection with the scandal. "We will be ruthless in punishing those involved," Mueller said. "And we will be comprehensive in learning from it so something like this never happens again."